Good news for AT&T customers. Three highly awaited gadgets have launched in line – Motorola’s famous Moto X, HTC’s One Mini, and Samsung’s Galaxy Mega 6.3. Gadgets enthusiast must never have been blessed with such bliss under the same roof before. Go exactly by the name. The HTC One mini is the smaller and cheaper version of the HTC One. It has arrived with a lot of common features like UltraPixel camera, BoomSound speakers, Beats Audio, and HTC’s latest Sense 5 user interface. Its difference lays in this screen size which is 4.3-inch, a slower 1.4GHz Snapdragon 400 processor, and 16GB of internal storage. The One mini is priced at $99.99 if you take out a new two-year contract. Samsung launches its largest smartphone till date under Galaxy Mega 6.3. 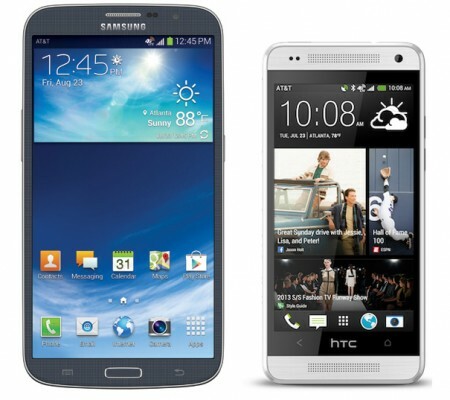 It has similarities of flagship Galaxy S4 with a significantly bigger size i.e. 6.3-inch 720p SuperClear LCD display. This giant smartphone features a dual-core Snapdragon 400 processor, 1.5GB of RAM, and an 8-megapixel rear-facing camera giving better picture quality. The Galaxy Mega is priced at $149.99 with a new two-year contract. The Moto X is seen to be gaining maximum popularity among the three launches at AT&T. It is also the most expensive of all. The price is $199.99 and offers the best of specification to give your money worth. Its features include a 4.7-inch 720p display, a Qualcomm Snapdragon S4 Pro processor, Adreno 320 graphics and 2GB of RAM.